Pumpkins vs. Monsters - Halloween Is Now! Take up arms and ride into battle against the evil monsters that are trying to take over your pumpkin patch. It’s serious business and it will take all your strength to vanquish the enemy in Pumpkins vs. Monsters. Pumpkins vs. Monsters starts off with the first of many story levels called the “protection of the territory”. 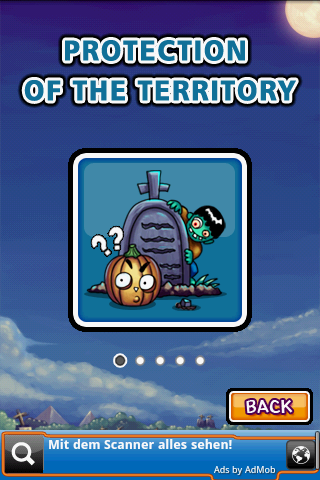 The goal here is to protect your property (i.e pumpkin patch) from the onslaught of downright terrible zombie monsters. Your pumpkin field looks more like a cemetery and is very blatantly Halloween-themed. The pumpkins come in different colors and pop out of the ground every second of every minute. Based on the rules of the game, you have to arrange pumpkins of the same color in rows of three or more (orange and green are the only two colors available). Please note that the pumpkins must be touching either vertically or horizontally. Diagonal lines do NOT count in this game. Once you’ve created a small grouping of pumpkins, you have to move it to the top edge of the pumpkin patch. As soon as you hear the “bling” sound – it’s shootin’ time! Just swipe your finger across the screen to launch your pumpkins in the direction of the oncoming monsters. For every killed monster you receive points in the shape of golden coins. 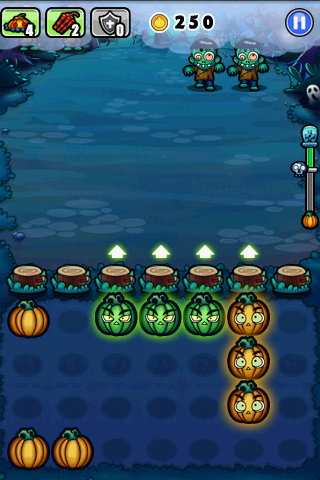 If there is a different colored pumpkin blocking the way for a group of like-colored ones, just double tap it to make it pop an disappear. But be extremely careful! If you aren’t quick enough at keeping the zombies at bay, the evil monsters start eating the tree stumps surrounding your lovely pumpkins. When worse comes to worse and the zombies start eating their way past the tree stumps, you can use a defense shield as a last resort. Pulling down the defense shield onto the tree stump, automatically repairs it. 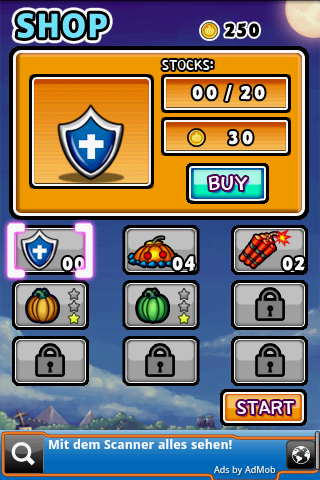 Additional weapons such as bombs can be purchased and thrown against monsters. Each level is over once you’ve accumulated a certain amount of money and another story level is unlocked. Sick and tired of the levels? Then go for the Endless mode where you zombies will keep coming and coming in never-ending waves of vileness. All in all, I think it’s a nice cute little game for here and there. You can stop or start playing it any moment – it doesn’t really have any impact on the game itself. Pumpkins vs. Monsters is really straight-forward and basic, which is nice for a change. It doesn’t infringe on your privacy by requiring any ridiculous permissions, so you can download the game and not worry about a thing. The game layout of Pumpkins vs. Monsters is very detailed and you can tell that someone put a lot of heart and soul into it. In the main menu you can select between the story and endless playing modes as well as adjust the background sounds. There’s also the possibility to upgrade your two Halloween-colored pumpkin types to a higher and more powerful variant. All your cash is earned through killing and annihilating monsters. Press start at any moment to come back to the main menu where you’ll sometimes be able to find useful tips. At the top of the screen, you can check how many weapons and how much cash you have available. You can also pause the game at any time by clicking the pause button in the upper corner of the screen. On the whole, both the controls and screen layout are logical and user-friendly. Most of the steps are self-explanatory. Enjoy! Whether your phone is young or old, Pumpkins vs. Monsters performs smoothly on devices of any generation. 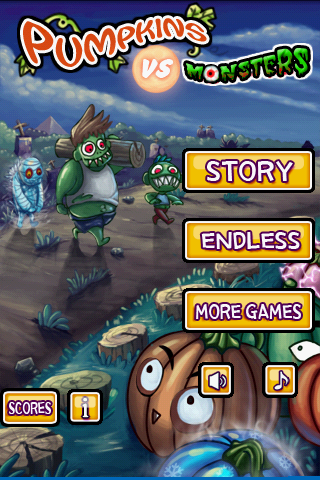 Pumpkins vs. Monsters is available for download for free from the Android Market.